Breastfeeding Tear Off Sheets are a letter sized pad with 50 sheets each that gives you an easy way to share breastfeeding information with your moms. 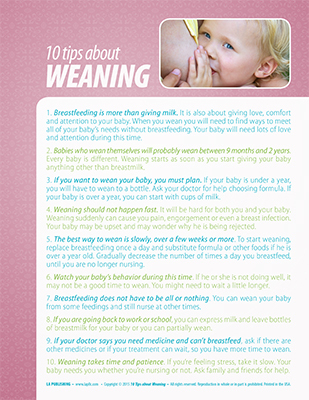 10 Tips about Weaning tear off sheets gives information, support and advice that moms need to prepare for and work through the weaning process. You can even create your own custom tear off sheets. Learn more about ordering custom products.